To develop teamwork and communication. Skills Practiced: Dribbling, kicking, trapping, shooting and passing. Explain the rules of the game and the basic rules of soccer. Ask the players to explain the rules of play back to you. 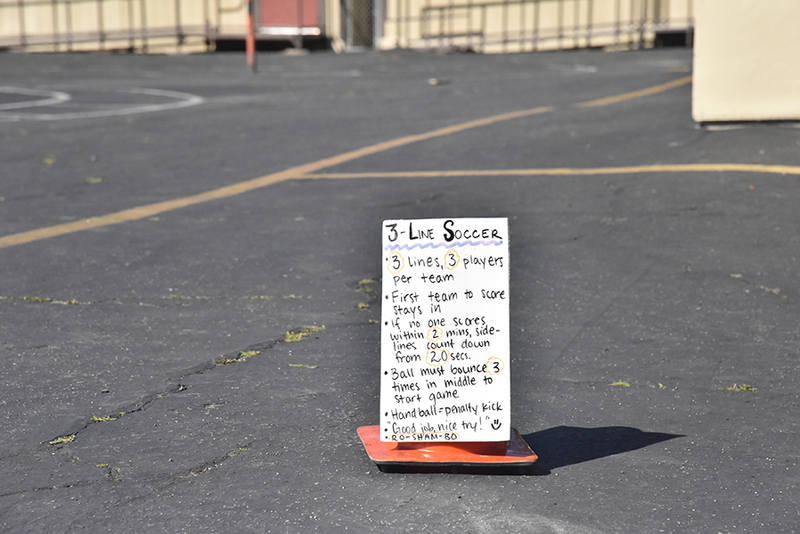 Place three cones along one sideline of a field, mark boundaries and create soccer goals with cones on either end. Have everyone stand in three single-file lines, one behind each cone. The first player in each line steps onto the field and form a team of three. The second player in each line steps onto the other side of the field and form a team of three. One player from each team plays a game of Rock Paper Scissors to determine who will kick off. Other players in line wait their turn to play while cheering. The object of the game is to be the first team to score. When a point is scored, that team stays on the field and the next three in line step on the field as a team. This oncoming team gets to kick off the ball. The team that did not score returns to the end of their respective line. After a set time frame (such as two minutes) if a point is not scored, have players waiting in line count down from ten, nine, eight, etc. If a team wins three times in a row they have earned three claps and return to the end of the line. Players must pass the ball to every teammate before they score. Play with just one goal. Teams who steal the ball while on defense must pass the ball one or more times before they can shoot.